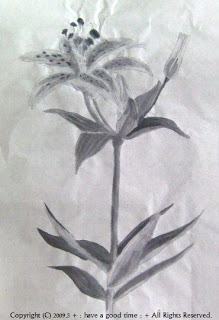 I drew the sumi-e painting of the lily today. The interior of the sumi-e painting is deep, so I should improve one's techniques. Sumi has even one color various light and shade. A considerable technology is required to express it. Therefore, I respect the painter who drew the sumi-e painting wonderfully. I also make an effort toward it. Thank you for your visit. I'm so happy to see you. Yeah, I'll keep to contact you and Europe. Oh, thank you for your reply comment. Your picture is so good. I'm looking forward to read your comment.